Planets and moons can be cut out of cardboard and colored however the players like. These planets can be cut to reflect their real size, unlike the counters in the game. For example, the Earth would be 1.3 inches in diameter. The moon would be .3 inches in diameter, 38 inches away from the Earth. Of course, the Earth and moon are not part of the Star Frontiers setting and no comparable information for the planetary systems actually in the setting. Regardless if a map is used, “space” is treated as if it is a flat plane, succumbing to the Khan Fallacy. To be fair, according to the box cover, Knight Hawks is intended for “beginning to intermediate players, ages 10 and up” and a three-dimensional starship combat system would likely be too complex for the target demographic. The advanced game introduces minelayers, light cruisers, and civilian craft. Offensive capabilities include mines, proton beam batteries, electron beam batteries, disruptor beam cannon, and seeker missiles. Screens are available as defensive systems in the advanced game. A proton screen “is a field of charged particles which surrounds a ship,” an electron screen “is the opposite of a proton screen,” and a stasis screen is evidently some sort of field with an “electrical pulse.” Each screen type happens to attract certain attack types. A proton screen attracts electron beams, an electron screen attracts proton beams, and “a stasis screen allows missiles and rockets to home in with increased accuracy.” When a ship with a given screen is attacked by that screen's 'nemesis' attack, the screen is used as the defense instead of the most effective defense the target may otherwise have. Damage effects are more detailed in the advanced game. In addition to the hull hits a weapon inflicts, the Damage Table is also consulted. Some example results from the table include 'weapon hit' (a particular weapon system is destroyed), 'hull hit' (“double normal damage”), and 'navigation hit' (“loose maneuvering control”). In the advanced game, crews can attempt repairs during combat. (A combat turn lasts ten minutes and repairs may be attempted after every third turn.) Each ship has a Damage Control Rating which can range from 30 to 200. When attempting repairs, the Damage Control Rating is divided among damaged systems. The amount allocated to a given system is the percentage chance that the system will be repaired. Hull repairs can restore 1d10 hull points. There is a section of the Knight Hawks Campaign Book titled The Second Sathar War. 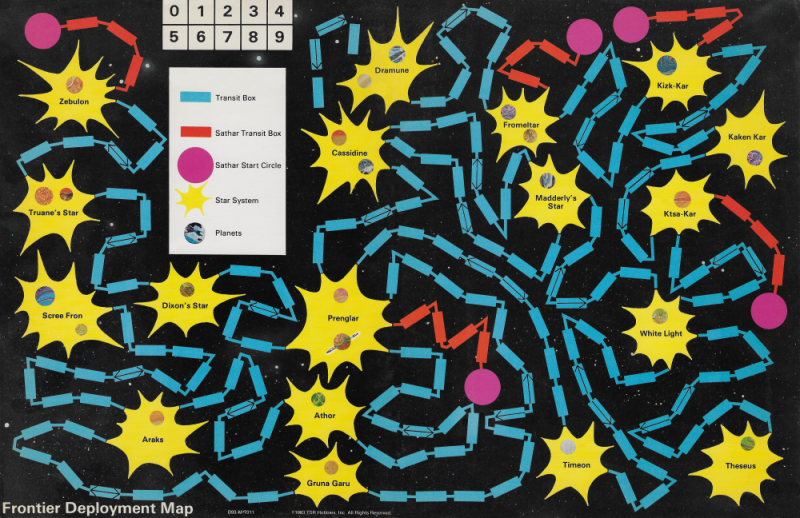 This section offers “rules for a strategic level boardgame about the second Sathar attack on the Frontier.” These rules employ the Frontier Deployment Map, an “abstract representation of the Frontier” (depicted below). When opposing forces are in the same system at the end of a day, there may be a battle. Depending on the number of ships involved in a battle, different rules are suggested. If there are more than fourteen ships, the basic rules are recommended. When there are five to fourteen ships, the advanced rules with “no skill modifiers” are recommended. With fewer than five ships, it is suggested that the advanced rules with “average NPC skills” be used. Among the spaceship skills introduced in Knight Hawks, there are 'gunnery' skills that can improve chances for attack success. Essentially, each level in a skill increases the chance for success by five percent. However, when skills are applied to starship combat, the base chance for success is usually reduced between five and fifteen percent. For example, against an electron screen, the base chance of success for an assault rocket is 60%; when gunnery skills are in play, the chance is 50%. The strategic game includes rules for supply lines and enhanced repair. There are optional rules for replacements (“available at the end of every 20 days”) and shatter drones (“A shatter drone is essentially a ship that has been turned into a huge bomb”). Of course, 2010: The Year We Made Contact, will never be evaluated on its own merits. It is necessarily compared to its predecessor and Stanley Kubrick is a tough act to follow. Naturally, we will examine Star Frontiers' 2010 Odyssey Two Adventure in light of its predecessor. 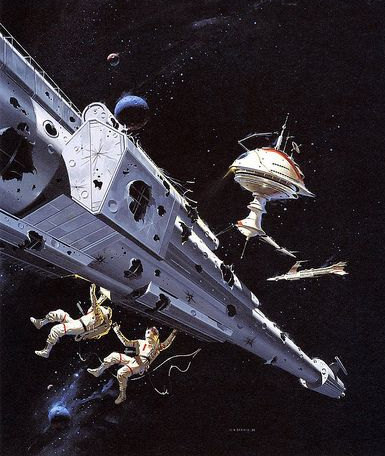 While the 2001 A Space Odyssey module had the novelty of man-apes, lunar antics, and a seven foot tall flame that asks characters if they want to “become a higher form of life,” the Odyssey Two module is relatively lackluster. Seven-hundred million kilometers from Earth, an alien monolith glides above Jupiter. Thousand-meter-long plumes of flame and sulfur shoot up from volcanoes on a nearby moon, but never touch or scar the slab. Close by, the dark and lifeless spaceship Discovery tumbles end-over-end, abandoned since 2001. Now in 2010, your ship arrives to complete the Discovery's mission: solve the mysteries behind the monolith. You must also determine what happened to the Discovery's commander, who disappeared into the monolith nine years ago. Then, if its possible, you must repair the crippled Discovery and restart HAL, the super-computer that murdered most of the Discovery's crew. Unnoticed, the monolith stirs. It, too, has a mission prepared millions of years ago – about to begin. The module allows for exactly three player characters – pre-generated Americans accompanying a Russian mission to the Jovian system. As such, the “your ship” mentioned in the second paragraph does not indicate possession. 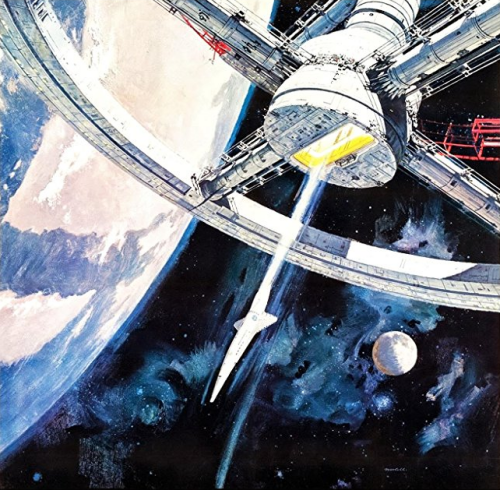 The three player characters are Dr. Chandra (HAL's designer), Walter Curnow (“in charge of designing and building the spaceship Discovery II”), and Heywood Floyd (scientist from the first film and representative of the authority that modified HAL's programming – resulting in HAL's insanity). The module provides less of a plot and more of a time table. The players are deprived of any meaningful choices; if they wander “off-script,” the referee is instructed to herd them back into place. In contrast to the previous module's four chapters, Odyssey Two has ten. In the first chapter, the characters are briefed, tour the Russian ship Leonov, and spend two years hibernating. In the second chapter, the Leonov aerobrakes by passing through Jupiter's atmosphere. With successful skill rolls, the Americans can reduce the number of problems the Leonov encounters during the maneuver and car address those problems as they occur. Each unresolved problem causes the Leonov to expend fuel. This would seem to be important for Chapter 8 when the Leonov leaves the Jovian system. However, ultimately, success in Chapter 8 does not depend upon the amount of fuel. Perhaps in an earlier draft of the module it did. In Chapter 3, the player characters salvage the Discovery. It is by far the longest chapter in the module; eight pages out of thirty-two. Given that four of the thirty-two pages comprise a pull-out with character stats, Chapter 3 represents almost 30% of the module. The chapter provides details about the Discovery and describes the various tasks and skill rolls necessary to make the ship operational. The most important part of the chapter is the reactivation of HAL. The referee makes two skill rolls for Dr. Chandra so that the players don't know the results. There is a 58% chance that either roll will fail, causing HAL to have faulty programming. If this occurs, HAL eventually attempts to kill the player characters. Whenever the player characters “do something directed toward the [Jovian] monolith” (such as approaching it with a pod), a roll is made on the 'Monolith Reactions' table. There is a 30% chance of no reaction. Two possibilities only seem applicable if one or more pods are near the monolith. Another possibility is for “Dave Bowman in his new form, a star child,” to exit the monolith and head “straight for Earth at the speed of light.” However, there is no way for the player characters to know this. Why bother putting this information in the module? Whether or not Bowman's exit is rolled as an event, Bowman appears in later scenes. The Americans receive a warning, the source of which the referee chooses or randomly determines. 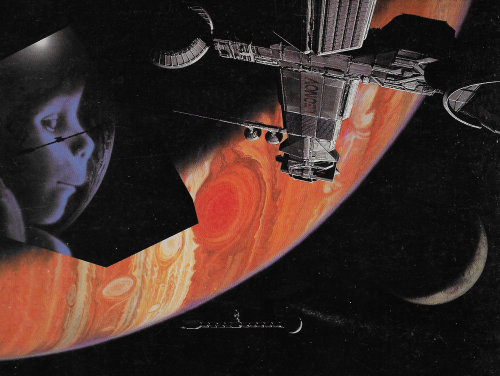 Regardless, the warning relates that the characters must depart the Jovian system in 2½ days. The Russians, however, don't believe the Americans. Any attempt to convince them fails. Twelve hours after the warning, the monolith disappears; then, and only then, do the Russians believe. The only way to escape the Jovian system in time is for the Russians and Americans to cooperate and link their two ships together. (For our younger readers, this is what's known as heavy-handed Cold War allegory.) Several skill rolls, player character and non-player character alike, establish how well the ships are linked. This – and not the fuel of the Leonov – determines whether the escape is successful. Also, with regard to the escape, HAL's cooperation is useful (but not strictly necessary) to fire the Discovery engines. Ten minutes before the scheduled time, assuming HAL is activated (and whether or not his programming is faulty), HAL decides to forgo firing the engines. The player characters must convince HAL to go along with the plan. This would seem to be an important role-playing opportunity, except that if the player characters fail to persuade HAL, Bowman shows up after eight minutes and convinces HAL. You know, star child ex machina. Anyway, Jupiter becomes a miniature star. Maybe the player characters survive and maybe they don't. A message is broadcast warning against any landings on Europa. Speaking of Europa, when the Leonov first reaches the Jovian system, it “detects strange readings” from that moon. The type of reading is determined randomly; it is either magnetic, radio, or traces of chlorophyll. The player characters can investigate or not; it doesn't really matter. Information about investigating Europa is relegated to the last chapter, sort of like an appendix. If they investigate, the player characters can opt for a manned expedition or a remote probe; it doesn't really matter. The magnetic reading comes from a natural meteor. The radio signals come from a crashed Japanese satellite. With the chlorophyll option, there might be a monolith under the ice; it doesn't really matter. Regardless of the type of reading – and regardless of expedition or probe – the player characters might see the movement of a “large gray-green mass.” Depending on the paragraph, it could be “grey-green” and on page 30 it happens to be “gay-green” (not that there's anything wrong with that). Just don't assume the sexual orientation of extraterrestrial life forms. This skill has two subskills: Empathy and Persuasion. These subskills are exactly the same as the Psycho-Social subskills Empathy and Persuasion. Politicians cannot use any other Psycho-social skill. 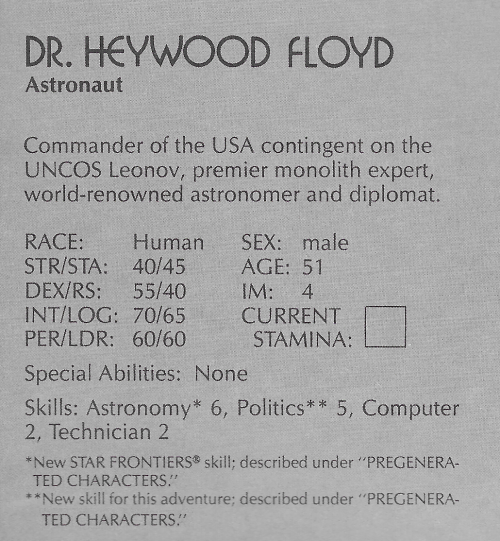 The only characters with Politics are Heywood Floyd and Colonel Tanya Kirbuk, captain of the Leonov. The first suggestion regards Sathar remaining on Volturnus after the retreat of their forces. Of course, they cannot be allowed at remain at large. “Who knows what evil plots they may be hatching?” Player characters might have a difficult time against Sathar guerillas, especially since the Sathar have a familiarity with – and perhaps some degree of control over – various Volturnian fauna (such as quickdeaths, slithers, and cyboslugs). Solving the mystery of Lizard Head rock. This strange rock formation is shaped like a giant lizard's head. The Eorna have always wondered about it, what it is, where it came from, who made it, etc. They have heard that there are large numbers of Yernoids in that area, but have never investigated these reports. Yernoids were introduced in Starspawn, inhabiting the same mound area as the Mechanons. 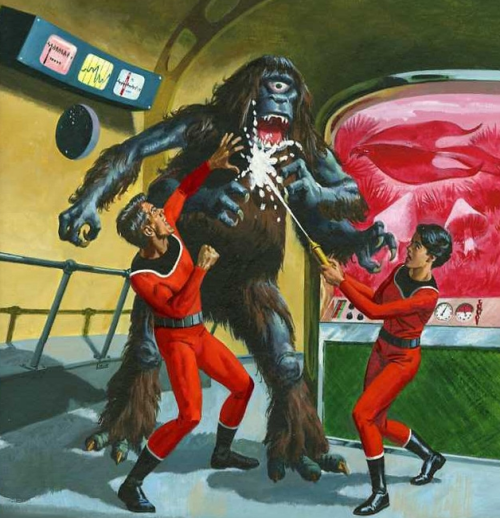 They “are man-sized bipedal dinosaurs which have developed a rudimentary intelligence, similar to an ape's.” Their description in the Alien Creature Update File indicates they are “30% likely to be armed with clubs.” The illustration shows a Yernoid brandishing a spear. One might think that a tool using species would be an excellent prospect for the Eorna's evolution program. Evidently, the Eorna do not think so. The actual location of Lizard Head rock is not disclosed; however, a hex marked with an 'L' appears near the eastern edge of the Volturnus map (shown below). 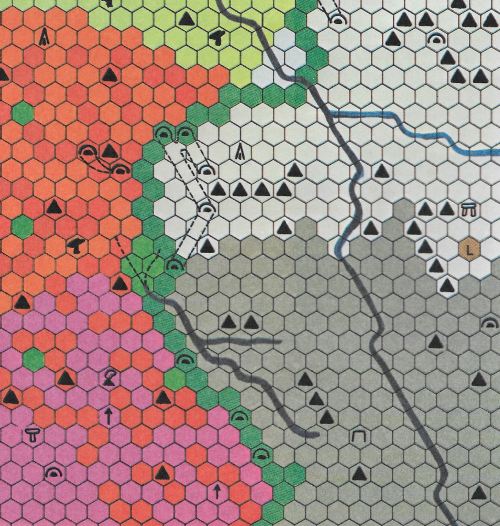 Nestled in the Crystal Mountains just north of the Gas Mist Mountains, 'L' is within commuting distance to an “unusual rock formation.” The line of mottled green hexes represents cliffs. The reddish hexes are lava beds and the purple hexes are a techtonic (sic) area. Aside from the three Volturnus modules, TSR published one other book featuring that planet – Villains of Volturnus. In 1982, TSR established its education department. 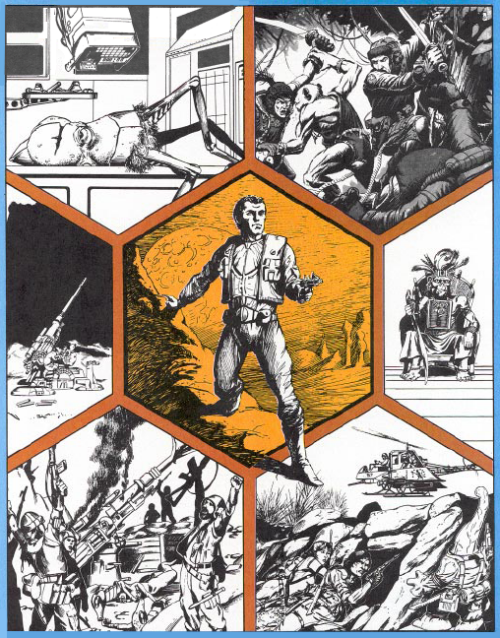 This department developed the Endless Quest™ series of gamebooks with branching-path plotlines. Lake Geneva resident Jean Blashfield was education editor of this department and she wrote Villains of Volturnus, the eighth of the Endless Quest™ books and the first not written by Rose Estes. The final pages of the book are advertisements for other Endless Quest™ books, the basic D&D set, and, naturally enough, Star Frontiers. There are four groups of villains that can be encountered in the plot: (1) pirates, (2) kidnappers, (3) surveyors, and (4) two Yazirians and a “large, fierce-looking human” in a skimmer. The skimmer crew only appear to reunite Kyiki with Jac and, theoretically, they could be associated with any of the other three groups. However, given that they leave Kyiki unguarded, it seems unlikely that they are with the kidnappers. The research ship is evacuated not due to pirates but because it falls into the atmosphere of Volturnus. Kyiki – with or without Jac – uses a Personal Safety Pod to reach the surface. A hovercycle is stored in the pod. 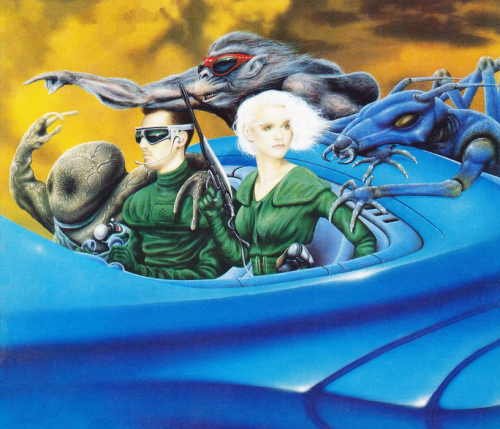 If Jac and Kyiki ride the hovercycle, it is discovered that Jac is, in reality, a Dralasite using a holobelt to appear as Jac. 'Holobelt' is Blashfield's version of the Star Frontiers holo screen, even though the rules do not describe the holo screen control unit as a belt. If Jac and Kyiki don't ride the hovercycle, then Jac is evidently not an imposter. The so-called pirates live in a shanty town and their piracy consists of robbing a Universal Minerals cargo ship (once the ship lands and unloads the cargo). The kidnappers reside in the remains of an underground Eorna city. The kidnappers work for the Sathar, but the kidnapping endeavor is apparently something aside from their normal duties, whatever they may be. The leader of the “kidnappers” is the aptly named Boss and only the Boss interacts directly with the Sathar. One of his underlings claims, “Sometimes I swear he's a hologram and all we're seeing is lots of images of him!” This suspicion is borne out when Kyiki discovers a holo disc of the Boss (or “holodisc” as Blashfield would have it). Although the book does not suggest it, these facts are consistent with the Boss actually being a Sathar (or any number of Sathar). In one branch of the story, there is a time machine of unknown provenance. (The Elmore illustration above depicts this time machine.) Via the time machine, it is possible to enter into a narrative time loop. Once in the time loop, it is possible to make a choice resulting in one of seven endpoints and there are two decision points that lead out of the loop. 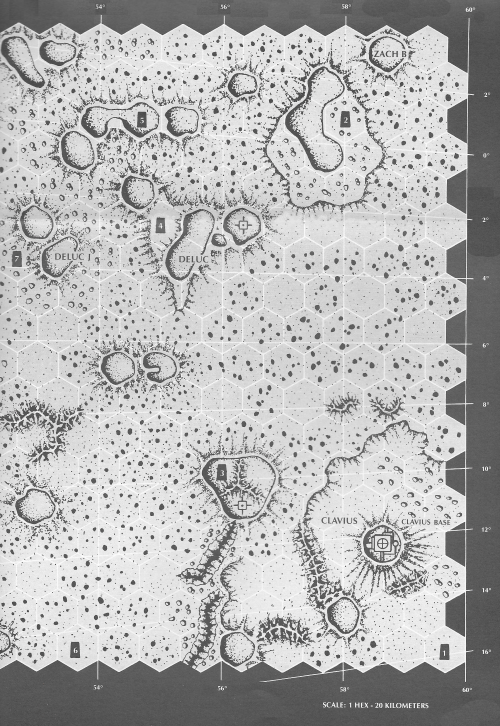 Blashfield dutifully incorporates various Star Frontiers details in her book. In terms of equipment, Kyiki has a vibroknife and a stunstick. In terms of animals, Blashfield mentions lopers and rasties (and a quickdeath makes an appearance). The alien fungus from Starspawn is also present in Villains of Volturnus. Its hydrogen emitting properties are not addressed, but its quicksand consistency and nitrous oxide generation brings about one of the story's endings. Blashfield even has a scene where the peculiar humor of Dralasites is addressed. Through various choices, Kyiki can encounter the Ul-Mor, Edestekai, and Kurabanda. While Blashfield presents the Ul-Mor and Edestekai much how they are described in the modules, the Kurabanda do not appear in their natural environment. Instead, they are flunkies of the kidnappers and surveyors. According to Planet of Mystery, Kurabanda resemble Tarsier monkeys. The illustrations in Villains of Volturnus do a better job of conveying this than the illustrations in the modules. Before you is a patch a low-growing plants with large, dangling, blue crystals instead of flowers. A small blue creature shaped like a box with legs trundles over to one of the plants and begins to nibble the crystal with a faint crunching sound. As you look into this chamber, you see three horrid-looking Eorna who gaze at you blankly for a moment. You immediately see that there are strange assemblies of wires protruding from their heads, and that their flesh has a strange discolored appearance. Transmission received. Attack fleet heading Volturnus at full operational readiness. Attack on planet will begin in two weeks standard time. Initiate standard procedures. The plan is to unite the races of Volturnus in a common effort against the Sathar. Although the races are suspicious of each other, it is possible that you, as impartial aliens, could overcome these suspicions and help them to fight the Sathar. The Mechanons evolved from Eorna robots. A large number of robots, including robot brains, survived the first Sathar attack. Some were linked to self-programming computers. Without Eorna guidance, groups of these robot brain/computer teams began building new robots. Improvements were added bit by bit, and eventually a group of self-programming super robots evolved. Over a long period of time, and with more and more refinements, these became the Mechanons. The Mechanons have three prisoners – one each of the Ul-Mor, Kurabanda, and Edestekai – who “find it almost impossible to get along together.” However, the three prisoners “will have heard of the player characters (if the players have played in CRASH ON VOLTURNUS and VOLTURNUS, PLANET OF MYSTERY) and will be eager to help the player characters and themselves escape.” This illustrates an important point, a party that has participated in the first two modules will have an advantage in that they are known to the three races they are trying to unite. Even if Starspawn is played in isolation, escaping with the three prisoners should facilitate acceptance of the party by the various races. The module does not address this. ...see an illusion of deep space, with galaxies far off in the distance. Lunging at them out of the void of space will be a horrible beast the size of a huge dragon. Panic ensues. I would think that an illusion of an empty room, being more plausible, might be more effective at protecting the contents of the room. To convince the Ul-Mor into cooperating with the other races of Volturnus, the party must participate in “the Great Game.” This is an important event among the Ul-Mor tribes: “The winner of the game has the coming New Year named after him...” The Great Game is somewhat like combative polo played on an obstacle course – complete with a sand shark. 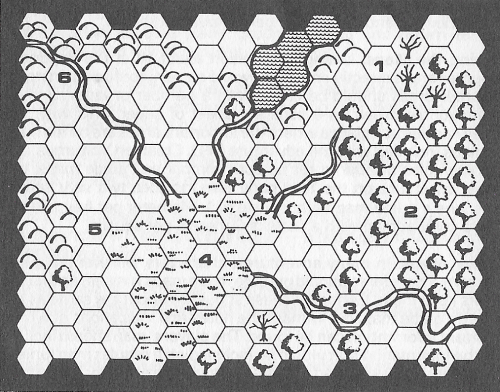 About two-and-a-half pages of the thirty-two page module describe the rules of the Great Game and the inner cover is devoted to a map of the field on which the game is played. A player character need not win for the Ul-Mor to join the alliance, but at least one member of the party must “stay mounted throughout the Great Game” to impress them enough to gain their military support. To enlist the Kurabanda into the alliance, the player characters must retrieve a “Sacred Idol.” Said idol was “stolen” by a giant Volturnian eagle (considered a demon by the Kurabanda) and taken “to the Demon's Temple in the forbidden area.” The “forbidden area” is a huge crater and “the Demon's Temple” is a pinnacle in the center upon which the eagle nests. The characters must climb the pinnacle because random explosions of hydrogen occur in the air over the crater. The hydrogen is emitted by an alien fungus brought to Volturnus via the meteorite that caused the crater. Edestekai society is heavily influenced by religion; interaction is governed by elaborate rituals and the leaders are priests. The Edestekai god of justice is embodied by a quickdeath, a type of mutated feline. In the first module, player characters were required to slay a quickdeath. To convince the Edestekai to join the alliance, the party must capture a live quickdeath. (The quickdeath kept by the temple has recently died.) At one-and-a-half pages, the Edestekai section of the module is the briefest. 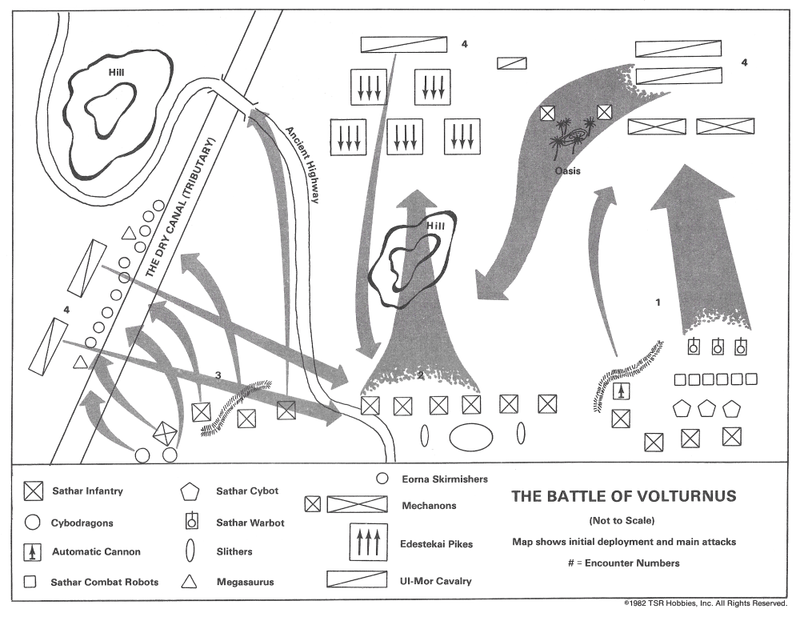 The penultimate section regards the much anticipated Battle of Volturnus, a diagram of which is presented above. The Sathar land ground forces and they march toward the Eorna center of power. “It is clear that if the Sathar penetrate the Eorna complex below Volkos,” the module says, “Volturnus is doomed.” Why the Sathar do not employ any sort of air support is not explained. (The defenders have air support in the form of Kurabanda hang gliders.) Given that the defense factions muster at the Eorna city, they must have known ahead of time what the Sathar planned. A percentile roll determines whether the overall battle is won or lost. 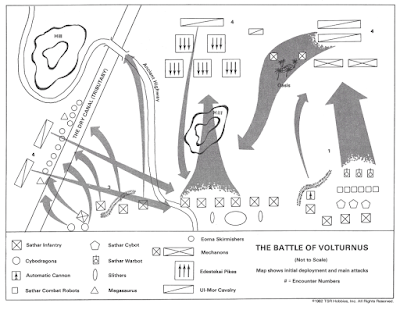 For every Volturnus race at the battle, there is a 10% chance of victory. Since the Eorna will necessarily be present, there is at least a 10% chance of winning. For each successful encounter, the chances of winning increase by 10%. This means there is a 90% chance of victory if all five races fight in the battle and all four encounters are successful. Even if the Volturnus forces lose the battle, it is possible for the Eorna to hold out in their complex until the Truane's Star battle fleet arrives. The final encounter is somewhat anticlimactic: “This section contains no action encounters.” The referee merely reads an epilogue. The Truane's Star battle fleet finds “an ancient orbiter still revolving in a very wide orbit around Volturnus.” The orbiter contains fifty thousand fertile Eorna eggs in cryogenic storage. Thus, the Eorna race is saved. These eggs are the titular Starspawn of Volturnus. Admittedly, 'Starspawn' sounds neat, but the eggs have almost nothing to do with the module. Something like Warlords of Volturnus would have been more apt. Scenario, sequel to “SF-0”: the adventurers, still marooned on Volturnus, must make their way across the planet to a forest. Once there, the alien Kurabanda may be able to put them in touch with other offworlders who can rescue them. Unfortunately, the offworlders turn out to be Sathar pirates. Includes two new intelligent races and six new creatures. This statement is wrong in several ways. The journey “across the planet” is only about a hundred miles. The “other offworlders who can rescue them” are instead presented as “Demons from the Sky” who take prisoners. In these circumstances, expectations of rescue might be optimistic. In the previous post, I discussed how the so-called pirates do not conform to common definitions of pirates but since the module refers to them as pirates, I will give this a pass. The pirates, however, are not Sathar nor are they associated with Sathar. There are briefings for three intelligent races, not two. Technically, one of the races, the Eorna, is briefly mentioned in the first module. However, that first module admonishes the referee, “It is very important that no hint of the Eorna be given to the characters.” The alien creature update file describes twelve new creatures, not six. One can quibble that a couple of the “creatures” are plants, but there are certainly more than six non-plant creatures presented in the module. On the other hand, the marooned part is totally accurate. Schick should have merely summarized the back cover copy. There is a half-page summary of the events of the prior adventure if the players did not participate in it. Given that the first adventure is bundled with the Star Frontiers rules, there's no reason not to have played it. Regardless, the Ul-Mor inform the party there are people like the player characters “living with the Kurabanda, a foolish tree-dwelling race.” The presumption is that these others are survivors from the first expedition. An Ul-Mor guide leads the characters part of the way to the Kurabanda, but they must travel the final leg of the journey themselves. Upon reaching the bachanda tree forest, they find “a raging battle between ten of the Star Devil's men and the Kurabanda.” The “pirates” will attack the player characters even if they don't come to the aid of Kurabanda. When five pirates have died, the remainder will attempt to escape; they “will not allow themselves to be captured alive, as they know the Kurabanda would torture them to death.” I suppose its possible for a pirate to be knocked out. According to the briefing update, “A Kurabanda stands 1.2 meters tall and looks somewhat like a tarsier monkey.” We learn that “Kurabanda are also natural practical jokers.” A paragraph is spent describing four typical practical jokes: The Fake Vine Joke, Snipe Hunting, The Fire Joke, and the Flea Joke. After the battle, the characters are taken to the Kurabanda village and, eventually, presented to the chief. Because the party (presumably) helped in the fight against the pirates, the chief “will be favorably impressed” but the players don't know this. After conversing with the party, the actions of the chief depends upon the extent to which he trusts the characters. Their are five possible reactions: Complete trust, Partial trust, Insulted, Greatly insulted, and Distrusted. The last two reactions result in the death of the characters. With the most favorable reaction, the chief conveys information necessary for the continuation of the adventure. With the partial trust reaction, the characters are given an opportunity to improve their standing. If the chief is insulted, “he will offer the party many, many gifts of furs, arrows, and wives.” These must be accepted or the characters will be killed. ...can learn that the pirates have discovered rich deposits of vibrillium and tomarillium in the hills of Volturnus. They have discovered an intelligent race, the Edestekai, living in the hills and have taken advantage of their religious beliefs to enslave them. They accomplish this by capturing priests, planting radio receivers in their brains, and convincing them that the voices they then hear are the voices of the gods. Of course, the voices are the pirates, telling them they must serve and obey the Star Devil and his men. Also in the computer is information that the expedition members have been taken to the pirate mining town awesomely named Slave City One. Other than information, the players can gain equipment from the outpost; they can also obtain a jetcopter. The Edestekai are an intelligent race descended from Volturnian arthropods. They are trilaterally symetrical, That is, if their bodies were divided lengthwise into three equal parts, the parts would be mirror images of each other. The body of an Edestekai is shaped like a giant peanut with three bulbous lobes on top. Three eyes are arranged in a circle around the narrowest part of the body, the midpoint or waist. The eyes are arranged in such a way that the Edestekai have a 360 degree field of vision. Edestekai have three lower limbs arranged like a tripod. The first and largest joint on each of these limbs is covered with a hard extension of shell and serves as a foot. The limb continues to a second and third joints which are roughly analogous to a Human elbow and wrist. Below the third joint are three tentacles which are used for grasping and manipulating objects. Underneath their bodies, Edestekai have a number of special thick cilia, or hair-like filaments. These cilia are used as a base to support the body when the limbs are extended completely straight. Except for their tentacles, cilia, and eyes, Edestekai bodies and limbs are encased in an exoskeleton made of chitin, a hard shell-like material. The mouth of an Edestekai is located near the base of the body and is hidden by the special cilia. The Edestekai communicate by means of a language composed of shrieks, whistles, groans, and other sounds combined with clicks of the limbs and signs with the grasping tentacles. It is assumed that the party will travel to Slave City One. On the way, they encounter an air whale. Part plant and part animal, an air whale generates hydrogen as a by-product of its diet (which includes “floating plankton”). This hydrogen, “stored in hundreds of inner membrane sacs,” allows the air whale to float. There are crystal-based life forms that live symbiotically with air whales. “These crystals focus sunlight into a beam,” the description states, “much like a laser.” The concept of air whales may be risible, but it has precedent in science fiction: Quest of the Three Worlds by Cordwainer Smith, The Wind Whales of Ishmael by Philip José Farmer, and that one episode of Blackstar. This lavishly furnished small one-room building contains a bed, bath, bar, holovision projector, several art objects (worth a total of 5,000 Credits), and numerous cheap books, mainly adventure novels. There is a shield mounted over the bed with the Star Devil's personal insignia on it. As you stand amid the ruins of Slave City One, you see in the distant desert a solitary figure surveying the wreckage of the pirate town. This creature is a tall fur-covered animal with a large tail, large hind legs, and small forelimbs or arms. The creature has a long, slender neck and a small head with large eyes. In its arms, the creature is carrying the unconscious Lieutenant Colonel Louis V. Jameson. The “messengers of the gods” are actually the Eorna, “a race of intelligent dinosaurs” nearly extinct due to the “Day of Death” inflicted by the Sathar. Less than 150 Eorna survived the Day of Death. They soon realized they were doomed as a race, for they knew that their numbers were not large enough to provide a viable gene pool. The survivors chose to dedicate what remained of their lives to the evolution of other intelligent races on Volturnus. The Eorna hoped to prepare these races to meet and defeat the Sathar. The Eorna are using a subtle process of hypnotic indoctrination and DNA manipulation to accelerate the development of three races toward intelligence. Most of the Eorna survivors have undergone cryogenic sleep, waiting to be awakened until they are needed to continue the project. Despite the fact that most of their young are born physically or mentally deficient because of the limited gene pool, the Eorna continue to breed, relying upon the few normal children to help continue the project. The underground complex of the Eorna is another sci-fi dungeon. Within the complex is the Asylum Storeroom, a trapped location. We read, “The player characters will not be able to detect the trap in this room.” [original emphasis] This trap is a “challenge to the ingenuity of the players.” While “air is pumped out slowly from the room,” the characters can use the contents of the storeroom in an attempt to survive. We are informed, “There are at least four ways the player characters can get out of the room alive.” One way is to electrolyze water. Another way is to create gunpowder from available chemicals. Since this is a challenge of player ingenuity, the characters do not need to possess Demolition skills to employ gunpowder. (“These are special conditions of this encounter and do not apply to other situations where gunpowder or other explosives may be used.”) Evidently, for this to work, the players must know how to formulate gunpowder. Once the characters have traversed five levels of the complex, they locate Jameson and the Eorna “attempt to make friendly contact.” An exposition dump follows. There is one more section to the Planet of Mystery module, but I associate it thematically with the final module and feel it is best discussed in conjunction with that module. 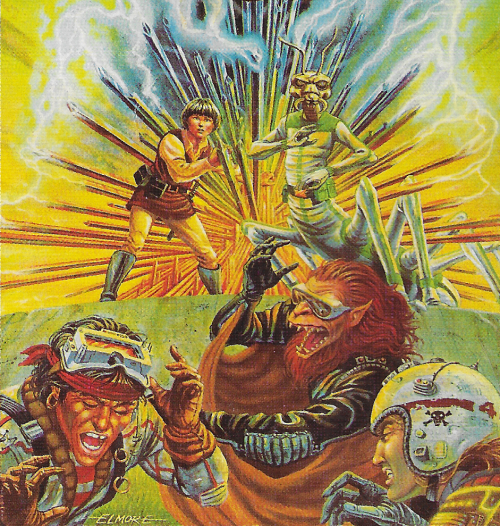 The introductory adventure module included with the Star Frontiers boxed set was Crash on Volturnus, having a designation of “SF 0.” The adventure continued with two additional modules – Volturnus, Planet of Mystery (SF 1) and Starspawn of Volturnus (SF 2) – sold separately. All three modules are credited to Mark Acres and Tom Moldvay. The Zebulon star system was first investigated 20 years ago by an unmanned exploration probe launched by Truane's Star. 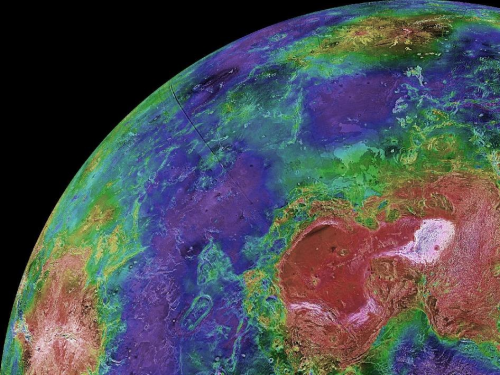 This probe indicated that Volturnus was the only inhabitable planet in the Zebulon system. It also indicated that great mineral wealth might exist on the planet in the form of molybdenum, tungsten, gold, and other heavy metals. Truane's Star soon made a legal claim to the ownership of Volturnus, and completed exploration of a star route to the Zebulon system one year ago. The first manned expedition to Volturnus from Truane's Star was launched nine months ago. The four member team of specialists was instructed to set up an outpost, gather data on the possible colonization and mining of Volturnus, and report back. Truane's Star has found itself short of personnel and funds due to colonial troubles and associated police action on Cygnus Omicrom IX recently. They have hired you, a team of unknown adventurers, to mount a relief expedition to Volturnus. Your mission is to explore Volturnus, gathering as much information as possible about mineral deposits, life on the planet, and other items of interest to future colonists. You are also to find and rescue the members of the original exploratory mission if possible. The government has provided you with a minimal amount of equipment, and transportation to Volturnus aboard the starliner Serena Dawn. After dropping you on Volturnus, the Serena Dawn will return in three months to transport you (and, with luck, the original exploration team) back to Truane's Star. While on the Serena Dawn, weapons and power packs belonging to the player characters are secured in the ship's weapons locker. Heavy gear has been placed in the cargo hold; player characters are allowed to retain only “non-weapon tool kits.” Anyway, when the ship enters the Zebulon system, pirates hijack the Serena Dawn. At least the module refers to the hijackers as pirates. I assume that pirates are interested in capturing and/or looting vessels; these pirates don't seem to have studied the job description. They wind up destroying the Serena Dawn and, although they post guards at the cargo bays, they don't actually seem to take anything. Additionally, I wonder why pirates would establish a base in the Zebulon system which is five light years away from the nearest system with any sort of starship traffic. The second module establishes that the “pirates” oversee an illicit mining operation on Volturnus. (It also establishes that the pirates work for the “Star Devil.”) I can understand destroying the Serena Dawn to keep the mining operation from being discovered, but it isn't piracy. Dragon #98 (June 1985) has an article which presents an “unofficial” background for Volturnus, providing a plausible explanation for the pirates as well as the identity of the Star Devil. The player characters don't learn about the hijacking via the alarm system or an intercom announcement. Instead, they “hear the sound of scuffling outside [their] cabin.” There are five random encounters which take place in order. They are random in regard to when they take place. On each turn, there is a 10% chance of the next sequential encounter occurring. The fifth encounter is actually an event: “The ship begins to vibrate badly.” The is the cue to evacuate the ship. Meanwhile, the player characters have some amount of agency and move about the area of the ship represented on the Starship Bridge Area Map. (The bridge, incidentally, is in two separate sections.) One possible course of action is for the player characters to go to the cargo bays. Aside from their equipment, player characters can find things like a “Holographic fireworks projector,” “Yazirian punching bags,” “Packets of dehydrated food,” etc. Some of these items could be of use to enterprising players. However, why a ship transporting an exploratory expedition would have cargo like “Large machine gears” and “High fashion Human dresses” is not apparent. Eventually, it is assumed that the player characters will board a lifeboat and venture to Volturnus. Unfortunately, as indicated in the module's title, the player characters crash on the surface of the planet. With the lifeboat on fire, “The characters have enough time to remove the survival packs...but no other equipment can be removed.” On the other side of the Starship Bridge Area Map, there is a colorful planetary map of Volturnus representing an area “about the size of the state of Colorado.” The lifeboat crashes in a desert in the southwest quadrant of the map. A dashed line circles the lifeboat crashsite. This is the movement limit for CRASH ON VOLTURNUS. It is important the characters do not pass this line, especially if you plan to play the sequel to CRASH ON VOLTURNUS. If the characters reach this line, turn immediately to planned encounter 3 (the Ul-Mor). In addition, if the characters begin to die of thirst or starve, turn immediately to planned encounter 3. The Ul-Mor also have a ninth limb, a tentacle about 30 centimeters long. This tentacle is an extension of the spinal cord. The end contains a hard cartilage point encasing a series of nerve endings. The Ul-Mor can insert the tip of this tentacle into the fatty tissue surrounding the spinal cord of other creatures, achieving a nerve link which allows them to communicate directly with the creature's mind. The Ul-Mor use this tentacle so effectively they can achieve a direct mind-link with any being. Before meeting the Ul-Mor, there are various encounters the player characters can have in the desert, both random and planned. The five random encounters are: (1) Burrower Snake, (2) Sand Storm, (3) Funnel Worm, (4) Sand Shark, and (5) Lopers. Often used by Ul-Mor as mounts, lopers “are two-legged reptiles the size of horses.” The “Lopers” encounter is what I call a “bear cub” moment. 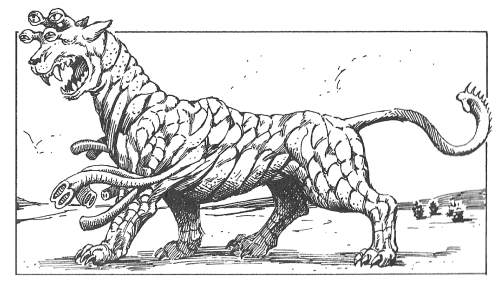 In D&D module B3, Palace of the Silver Princess, the adventurers can come across a bear cub that “appears to have been abandoned by its mother.” Player characters can choose to adopt the cub – a type of role-playing opportunity not typically afforded in a dungeon crawl. In the “Lopers” encounter, the Volturnus castaways find “a dead female loper that has just given birth to two babies.” Adopting the baby lopers can result in a pay-off when the player characters eventually meet the Ul-Mor – “if the characters have the baby lopers with them, the tallest Ul-Mor will ceremoniously drop his weapons and raise four of his tentacles.” I suppose this is a good thing. 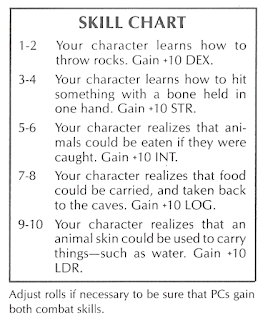 It behooves the player characters to cultivate the good will of the Ul-Mor; the rest of the module depends upon it. The Ul-Mor can provide food and water to the player characters only if they agree to join the Ul-Mor tribe. Assuming they agree, the Ul-Mor will lead the characters to the Place of the True Warriors where the initiation ritual can occur. Evidently, the safest route to this place is through the Forbidden Caverns. In the caverns, the characters become separated from the Ul-Mor and must make their way through the science fiction equivalent of a dungeon. This is the most detailed portion of the module. A person who reads a programed adventure to the players as they play, rather than playing a character himself. The reader is replaced by a referee in the Expanded Game. In the two adventures detailed in the Basic Game Rules, the player characters are troubleshooters working for the Pan-Galactic Corporation (“The oldest and largest interstellar company” and “one of the most powerful organizations in the Frontier”). The reader “controls the opponents the other players meet and reads the adventure to them.” By default, the player characters are armed with “fully loaded” laser pistols. In the first adventure, each player character also has a standard equipment pack that includes a doze grenade because...well, just because, OK? At the start of the first adventure, “PAN-GALACTIC SECURITY BREACH,” the reader informs the players that their characters have been assigned to investigate 'raiders' of Pan-Galactic's research centers. The reader then presents three options, each of which leads to different events and further options, much in the vein of a Choose Your Own Adventure® book. An option is not necessarily a choice, but could be the result of an event beyond the control of the characters. A diagram of the events and their connections is presented below. 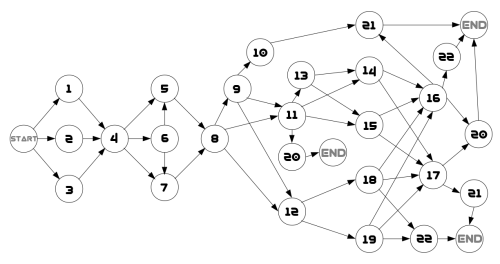 The early portion of the adventure does not allow for meaningful variation; all paths lead to event #8. Ultimately, the adventure results in one of three concluding events. Each of these conclusions leads to the same endpoint – the player characters listen to a message that establishes that raiders are employed by the evil Sathar. Then it describes the raiders' next mission. They are to fly to a top secret military asteroid where research is underway on a special weapon that can reduce entire populations to mass hysteria. They are to meet other agents who have already infiltrated the base and steal the device. Obviously, this could be the basis of a further adventure, but one which the reader must develop. The first adventure is replayable; different characters could be used and different options may be pursued. Another variant allows characters to equip different weapons by allocating a number of points (e.g., needler = 4 points, gyrojet = 6 points, etc.). There is also a competitive variant where some players control the troubleshooters and other players control the raiders. In contrast to the first adventure's network of options and events, the second adventure is a simple situation. In “ALIEN CREATURE ON THE LOOSE,” the player characters must stop an alien creature – a hydra – rampaging through Port Loren. For purposes of replayability, there are rules that allow a reader to create a different alien creature (although it is still called a hydra). To find its DEX/RS, roll d100, find the result on the ABILITY SCORE TABLE and add 5. The creature gets 30 Stamina points and one attack per player character. The person controlling the hydra then gets to select its movement speed, attacks, defenses, up to three special abilities, and its goal. 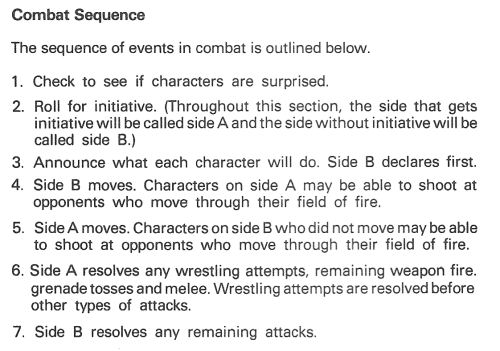 Notice that reader also can have characters run into events and obstacles as well as opponents. Anything you can imagine can happen during a STAR FRONTIERS adventure. an “ancient alien artifact” that has taken over a Pan-Galactic base. Included in the Expanded Game Rules is a two page section on how to create an adventure. Six steps are listed that differ from those in the Basic Game Rules. Choosing a theme or basic story and the goal of the adventure. Writing a final outline of the adventure to guide the referee through the action. 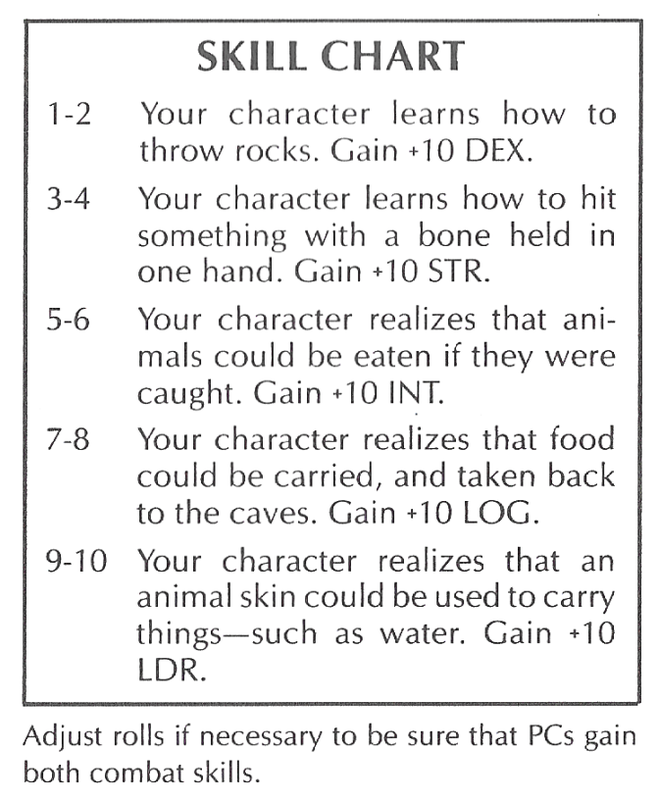 A description of what happens when characters enter the setting, including NPC and creature reactions. Read your script several times, putting yourself in the position of a player trying to move through the adventure. Make different choices to see whether you accounted for the most likely possibilities. Make sure your challenges are not too easy or too difficult. Players should need to use reason and judgment to overcome the challenges. However, you cannot think of everything before the game, so try to be flexible and make sure each event challenges the players. There is a one page sample adventure wherein player characters are supposed to find a ship “believed to have crashed” as well as “rescue any survivors and find out why... [it] crashed.” At the crash site, the player characters can rescue a “small Yazirian child.” They may also discover evidence “that a bomb was planted in the cargo.” Again, this can be the springboard for another adventure. 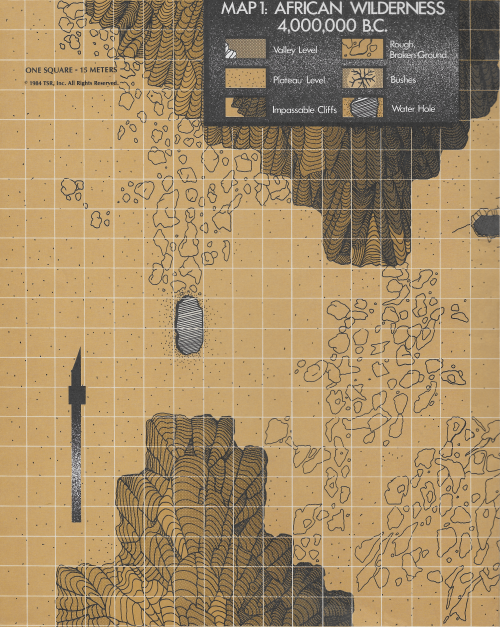 We are informed that, “A guide map typically has a scale of 1 to 20 km per hex or square.” The scale for the above map (from the sample adventure) is not disclosed. If the players cooperate and reach their goal, everyone wins. A skilful player who uses the same character in several adventures will see that character rewarded, becoming richer, more powerful and able to handle more difficult missions. Each character has an Initiative Modifier equal to one-tenth of his (or hers or its) Reaction Speed. At the onset of every turn, both sides roll d10 to determine initiative. For a given side, the Initiative Modifier of the character with the highest Reaction Speed is added to the result. The combat sequence is straight-forward. First, the side with initiative moves then attacks. Afterward, the other side moves then attacks. On a turn when the modified initiative rolls are tied, “the side with the highest single reaction speed moves and attacks first...However, damage caused by successful attacks does not take effect until after both sides have fired that turn...” The fact that all characters on a given side move based on the speed of the fastest character is somewhat unrealistic, but realism must defer to practicality for ease of play. In the Expanded Game Rules, characters can “roll their own initiative” and take actions in appropriate relation to one another. So, the side without initiative actually moves first. The logic of this escapes me. When initiative roll results are tied in the Expanded Game Rules, “the side with the highest modifier has initiative.” No provision is made for simultaneous damage effects. In the Basic Game, an attack is successful if the result of d100 is equal to or less than the attacking character's Dexterity. “A roll of 01 – 05 is always a hit,” we are told, “regardless of modifiers, if the target is visible and in range.” In the Expanded Game, ranged attacks are successful on a roll of half of the character's Dexterity; melee attacks are successful on a roll of half of either Dexterity or Strength, whichever is greater. Each level of a weapon skill adds 10% to the character's chance to hit with that type of weapon. Also, with the Expanded Game a roll of 96 – 00 is an automatic miss. A roll of 01 – 02 knocks the target character unconscious. When using “a blunt weapon (including bare hands),” a result of any multiple of ten (equal to or less than the chance to hit) also causes unconsciousness. With the Martial Arts skill, the 01 – 02 chance is increased by 1% per level of skill. Stamina may “heal naturally at a rate of 1 point for every 20 hours (i.e., a day in terms of Galactic Standard Time) that the character spends resting.” A character can heal up to twenty points of Stamina per day while in a hospital at a cost of one credit per point plus fifty credits per day. ...the weapons do a surprisingly small amount of damage, no more, than one or two dice. Figuring the average of 1d10 as 5.5 and the average stamina as 45, characters will have to be hit about four to eight times (depending on weapon strength) to be knocked unconscious – and this without benefit of defensive armor! Because of this relationship between weak weapons and strong characters, firefights can get a bit monotonous and drag on and on. Not only is this somewhat “unrealistic,” but it slows the game down precisely when it should be at its most fast-paced and exciting. Because of increased rates of fire and the opportunity to change energy settings on beam weapons, characters can do considerable damage with their weapons in the expanded game, putting excitement and a real sense of danger into combat situations. In addition to damage taken against stamina, some weapons can cause unconsciousness. To help the characters out in this suddenly more dangerous environment, there are several types of defensive suits and screens that can absorb damage from certain types of attacks. A wide variety of of weapons are available. The 'Beam Weapons' skill covers use of “elecrtostunners, heavy lasers, laser pistols, laser rifles, sonic devastators, sonic distruptors and sonic stunners.” The 'Projectile Weapons' skill applies to “automatic pistols and rifles, bows, muskets, needler pistols and rifles, machine guns and recoilless rifles.” However, gyrojet weapons have their own skill.